We were in Wales when it first became clear that a rethink of our Thames Path plans may be in order. We’d gone for a ride on the Talyllyn Railway – the world’s first preserved heritage railway – and alighted at the end of the line for a walk. Sam – now 19 months old – would have his afternoon nap in the back carrier as we walked, and when he woke up, he could stretch his legs and enjoy the great outdoors. Our walk would take us to the next station, arriving in plenty of time to have a cup of tea and let Sam play in the station’s playground before we caught the last train of the day back down the line. On paper it seemed perfect. In practise, we spent much of the afternoon trying to persuade Sam to stop plopping stones into puddles on a gravel path. This was difficult, for if there’s one thing a 19 month old child loves going, it’s plopping stones into puddles. With one eye on the clock we went through a series of increasingly desperate attempts to get Sam moving, ranging through encouraging him to take a pebble to the next puddle, through to trying to persuade him to race with a dog that happened to be nearby. It was to little avail. Even the cries that we were going to go to the playground fell on deaf ears. Who needs a playground when puddles are so much fun? Besides the puddles are here, and the playground was far away. The next day we drove to a waterfall. It was a local beauty spot and one we felt we should have a look at. The walk from the car park was barely half a mile, but Sam didn’t get anywhere close to that. There was a culvert next to the path, and a happy forty five minutes were spent dropping leaves in it and watching them float away. “Can you imagine trying to do an eight mile walk with him?” Catherine had asked. And we looked at each other and knew our family walks down the Thames Path were at an end. Now don’t get me wrong. It’s great walking with toddlers. They love getting out and exploring nature. It’s all great fun. However going on a walk with them is different. You need to be flexible, have plenty of time and (preferably) have not too far to go. Walking from one place to another along the Thames Path just didn’t fulfil those criteria. Truthfully, I never really thought we’d get all the way to the source with Sam. After all, the last four stages of the trail are next to impossible to do in short day walks, accessible by London. However I’d always imagined that as a family we’d at least get to Oxford. So it felt rather strange to be sitting on a train to Staines-upon-Thames by myself. Still, without a small child in tow, there was a good chance that progress might just be a little faster. I weaved my way out of the throng of teenagers who were making their way for a fun-filled day of roller coasters, sticky brown soft drinks and dodgy burgers at Thorpe Park theme park. Theirs was to be a day of long queues as hundreds of people tried to all get on the “best rides” at once. I’d been there myself a few years earlier for a stag do. One half of the group had gone off to ride one of the roller coasters, whilst the rest of us had headed off for more sedate pleasures. After ninety minutes, we’d managed to do five different rides and found time for some lunch. The other group were still queueing for their first. The Thorpe Parkers were, at least, spared the delights of Staines Town Centre, which consisted of the usual assortment of chain stores, chain pubs and chain coffee shops. As so often happens in major British towns, it felt like I could be anywhere. Only “Staines-on-Thames Dry Cleaners” gave any real hint of the place I was in; that this was a town which England’s greatest river flowed through. 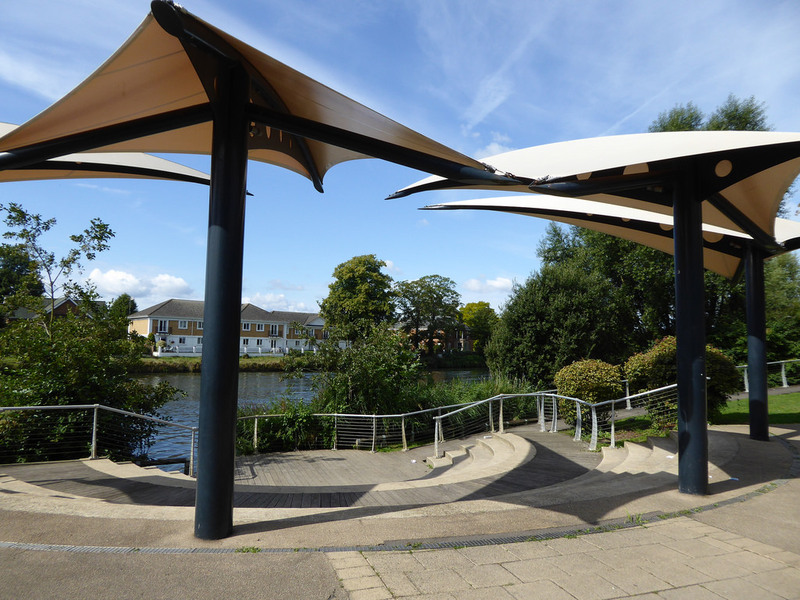 The Thames Path skirted the edge of the town centre and to pick it up again, I headed over to the Memorial Gardens. 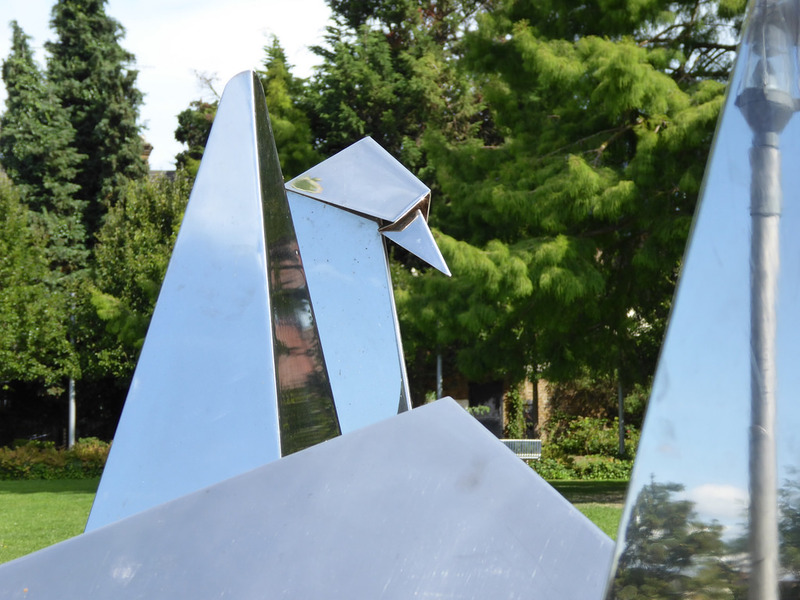 A small park on the river bank, it was filled with statues: an assortment of figures dancing in a circle, a giant metal arch and a large “folded” swan which looked like some clever person had done a large piece of origami with a sheet of polished metal. There was even a small amphitheatre which could only really house the tiniest of open-air productions. A one man performance of Macbeth perhaps, acted out in front of twenty or so people. At the edge of the park was Staines Bridge, where it was time to head over to the south bank, past assorted glass clad office blocks, car parks and even a water treatment works. The owners of the latter had thoughtfully provided it with a chain-link metal fence so that passers-by could stare through and admire the might and majesty of Sludge Tank Number 2. I passed another Coal Tax Post, and mentally totted up how much coal I was carrying (none) and what levy I was due to pay to the authorities (el zilcho.) Somewhere hidden behind the willow trees on the opposite bank sat another marker. In days gone by, the London Stone stood to mark the limit of the City of London’s jurisdiction over the River Thames – a role it kept from 1285 until 1857. The original stone has long since departed the river banks. It was moved in 1986 and now lives in the nearby Spelthorne Museum, with a replica standing in its place instead. After the excitement of the sewage works and Sludge Tank Number 2, I walked through the riverside grounds of the Runnymede-on-Thames Hotel; its lawns already bustling with people enjoying the sun. A giant game of Connect 4 was being ignored by a group of children who were having far more fun throwing themselves down onto a group of giant beanbags. The hotel even had an outdoor swimming pool, discretely tucked next to some tennis courts near the river. All these facilities, and with easy access to the M25 too? What more could a punter wish for? Ah yes, the M25. That mighty organ; the mega road that forms a mental and physical boundary around London. Two substantial bridges crossed the river, carrying the motorway and local roads across it, with their load of cars and lorries. I may have left the county of Greater London some miles earlier, but for many the M25 marks where London’s influence truly ends. So much so that some weeks earlier I’d read that one of the area’s politicians had suggested that places like Staines should be merged into the capital’s administrative boundary; that the capital should be effectively all land enclosed by the motorway. The good weather had filled Thames with pleasure boats, whose names ranged from the pondering (“One Day”) to the attempts at sauciness (“Naughty Lass Too”), via the ultra-capitalist (“Aquastition”), the corporate sounding (“Judge IT”) and the proto-political (“Suntory”). Then there was the misguided attempt to get with the Zeitgeist: I present for your consideration the boat named “#wtf”. Not for the first time, I pondered the appeal of owning a motorboat on the Thames. It wasn’t as if there was an amazing array of places you could visit in one. Most of the boats pootling along the Thames would spend their lives going up and down the same few miles of the river; a journey where the key decision on setting forth was whether to go upstream or down. As I walked I’d regularly notice too just how slow their journey was. Several times throughout the day I passed the same motorboats that had earlier overtaken me. It’s not that the boats were slow; far from it. It was more a reflection on the amount of traffic on the Thames, and the number of locks. Outside each one was a large queue of boats waiting to get through. Your boat may be a big leviathan, however if that camping skiff got to the lock before you, you’d just have to wait. 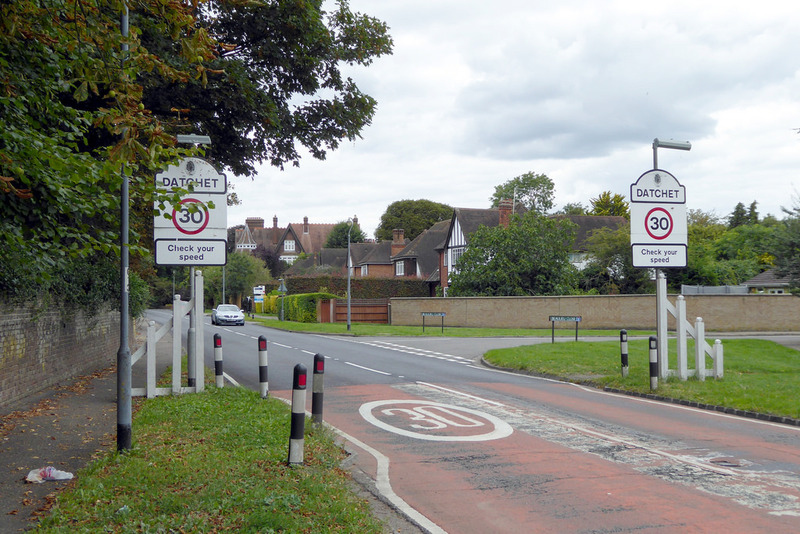 I was entering Runnymede, proclaimed the National Trust sign on a narrow strip of grass that lay between the river and the bustling A308 road. Ah, history, I thought. For this was the place that the Magna Carta was signed in the 13th century: the world’s very first constitutional document, and one which would lay the foundations for democracies across the globe. Thanks to its age, no one is now exactly sure where this famous document was actually signed. 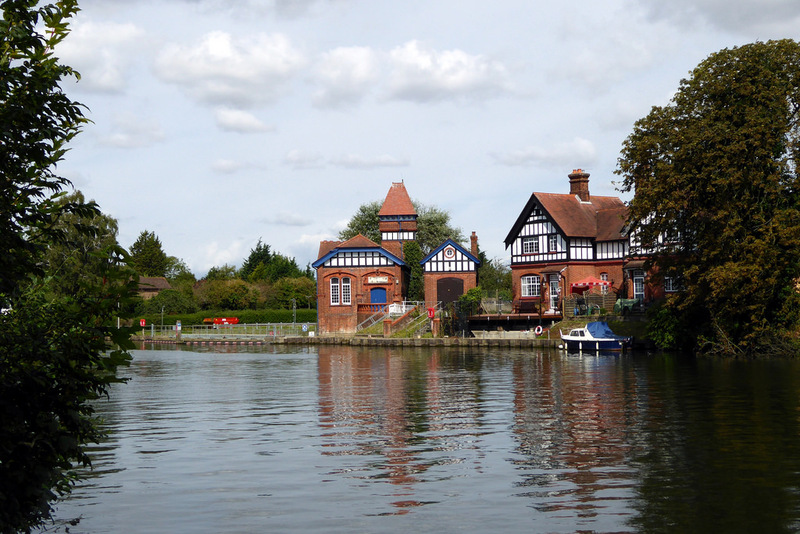 Some suggest the island in the Thames now known as Magna Carta Island. Others believe it was on the riverbank, or further inland. Whatever the answer, the land that it was signed on was only given to the nation in 1929 on the death of its previous owner; the fantastically named Sir Urban Broughton MP. It took until 1957 before someone commemorated that famous document, and even then it wasn’t funded by the British, but by the American Bar Association – an association for lawyers and law students – who paid for a monument to be erected, and have been stumping up the cash for repair and cleaning work ever since. 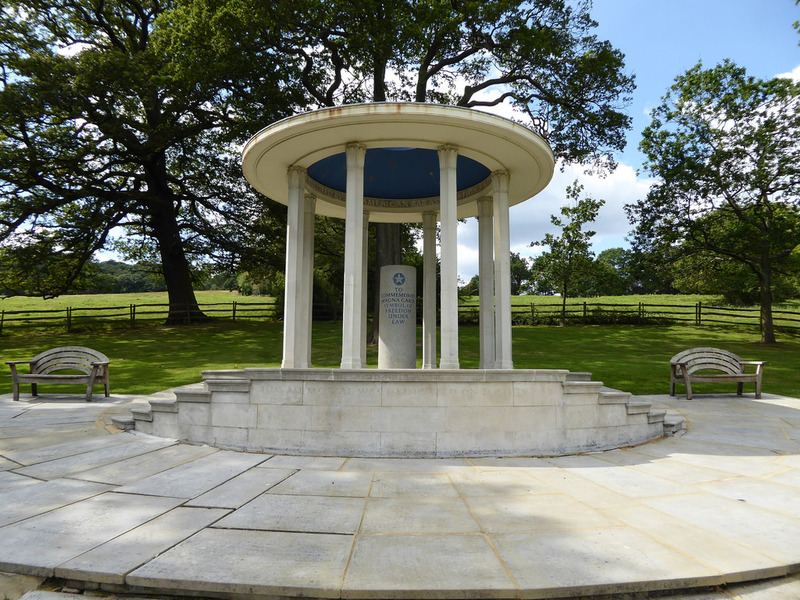 The simple domed monument that they built, the Magna Carta Memorial, sits a short way back from the Thames on another of the sites where the document could have been signed, and naturally I went off to look at it. An interpretation board explained the history of the site in great deal, although declined to explain why the monument had been called a “memorial”. Had democracy died without anyone telling me? The Bar Association are not the only Americans with an interest in the area. A short walk away sits a little piece of Berkshire that was gifted to the United States of America in 1965, on which can be found the John F Kennedy Memorial, which I dutifully visited next. Why, of all the places, site it here? Well your guess is as good as one, but place it here they did. 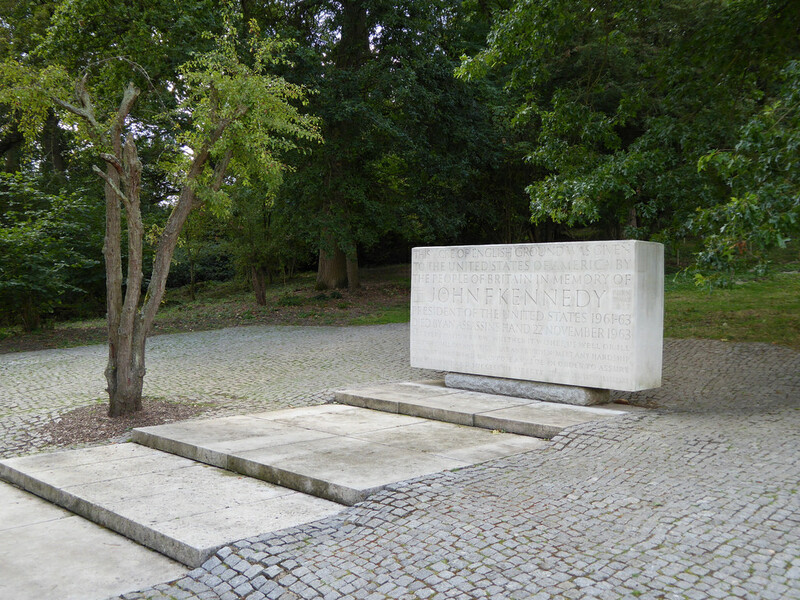 The memorial, made out of a large piece of Portland stone, is engraved with an inscription dedicating it to Kennedy. I made my way back to the Thames, skipping the area’s third memorial – for the airman and women of the Commonwealth, whose memorial sits on top a nearby hill, visible to all around – and towards the fourth. The Urban H. Broughton Memorials consist of a twin set of large kiosks and posts, one set of which now houses a National Trust café. Dedicated to Urban himself, they commemorate that the land all about had been offered to the nation on his death, donated by his widow, Cara. 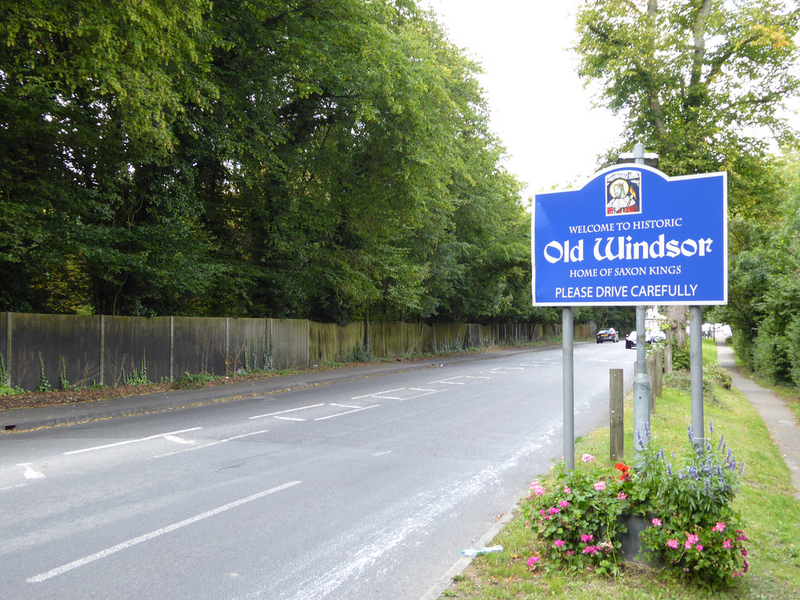 “Welcome to Old Windsor,” greeted the road sign. I peered at my map. There was no doubt about it. Windsor wasn’t that far away, although Old Windsor actually turned out to be a separate village. Besides, Windsor was only close by if travelling directly, and the Thames Path certainly wasn’t. The river’s winding tour of the area would mean there were several more miles to walk before arriving in the main town. It was lunchtime, but whilst the path at Old Windsor was lined with many benches, they were all placed right next to a busy main road and a distinctly unappealing pub. A relaxing lunch spot this was not, and I headed further along to find somewhere distinctly quieter rest whilst I chomped on my ham and egg roll. It turned out that there were plenty of seats; it’s just that they were all in people’s gardens. There wasn’t even much of a tow path. Most of the houses had fenced off their moorings, meaning that the path went through the narrow gap between fences. Even when the houses began to fall away there weren’t many options, until I stumbled on a small grassy area sheltered by trees which contained two benches. It was also under the flight path for nearby Heathrow Airport, and I watched as a never-ending stream of planes flew overhead. As they did, I peered at the many large houses lining the opposite river bank. Some people must have paid some serious money to live here, yet they were still subjected to the Boeings and Airbuses flying overhead. Another lock, and the Thames Path headed down another cut. 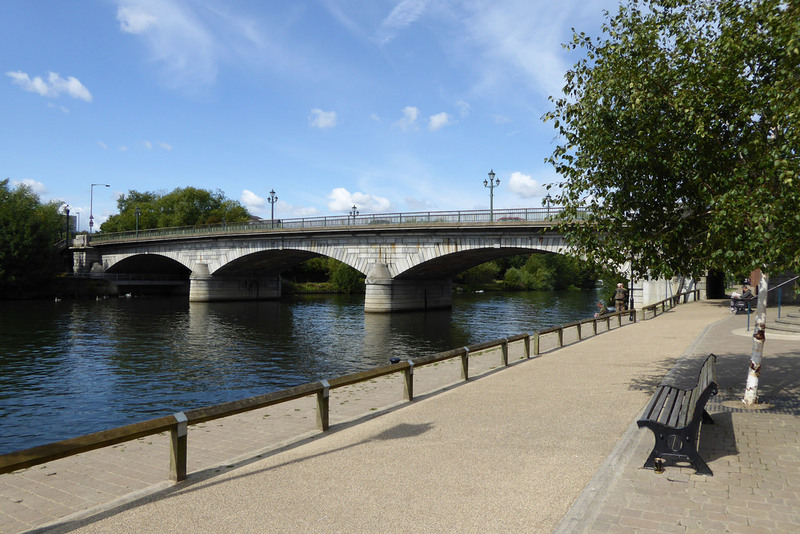 The Thames had another big loop in it, and a short-cut had been created so that boat users – and Thames Path walkers – could knock a mile off their journey. As I walked down it I began to realise that since I’d passed under the M25, the river had begun to change. Houses were giving way to fields, and as I stood and looked around, I realised that both sides of the river where I stood, were devoid of any buildings at all. Near the village of Datchett I even walked through a field of corn. 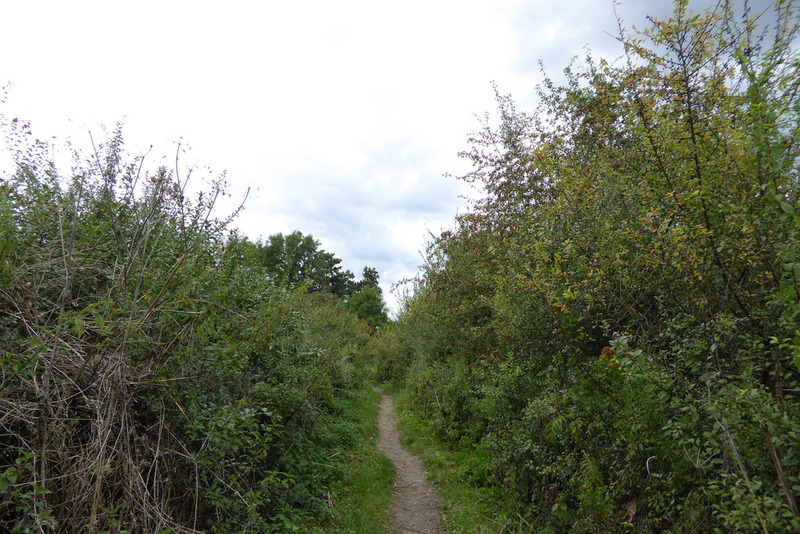 The tow paths had got narrower and wilder; strewn with overgrown brambles and nettles. The wide paths of further downstream were becoming a distant memory. Even more noticeable was how quiet the path now was. Previously the path had been bustling, full of joggers, walkers and more. Yet now I found I’d walked for half an hour and hadn’t seen a soul. When I did finally did see someone, it was not a walker but a fisherman his tackle strewn over the path like he hadn’t expected anyone else to come this way. Although the state of isolation and remoteness was swiftly dispatched when, a few minutes later, I found myself watching an open top sightseeing bus crossing over a near-by bridge. Then, near Datchett, the Thames Path left the river completely and headed inland; the first major detour away from the river since central London. One river bank was taken up by the massive estate of Home Park, in which sits Windsor Palace. 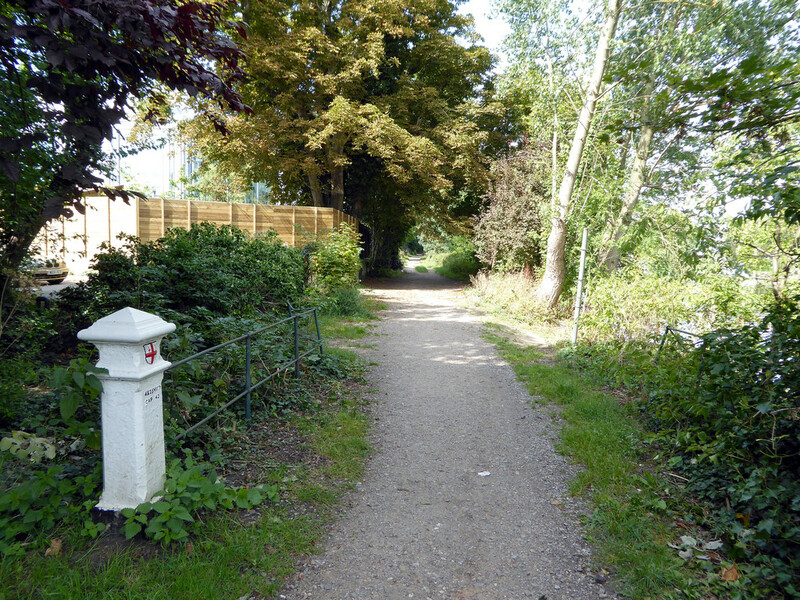 The Thames Path had already diverted back onto the north bank in order to avoid it, however now that too was inaccessible; hidden behind large wooden fences and sizeable gates. Deprived of its beloved water, the Thames Path wandered forlornly inland, forced to divert for a mile and a half down a busy road. Thankfully it was one equipped with a sizeable pavement, although when the pavement switched sides of the road, it took me a good five minutes before I could cross safely. Despite the size of the pavements, not many people seemed to actually walk in Datchett. Car after car sped by, however there was no one else on foot It was only when I finally got to head back to the riverbank – greeted by a fine view of Windsor Castle – that I saw anyone else on foot. All of a sudden I was passed by six different Thames Path walkers, all within a matter of minutes. Not all of Home Park is restricted to just the Queen and her friends. 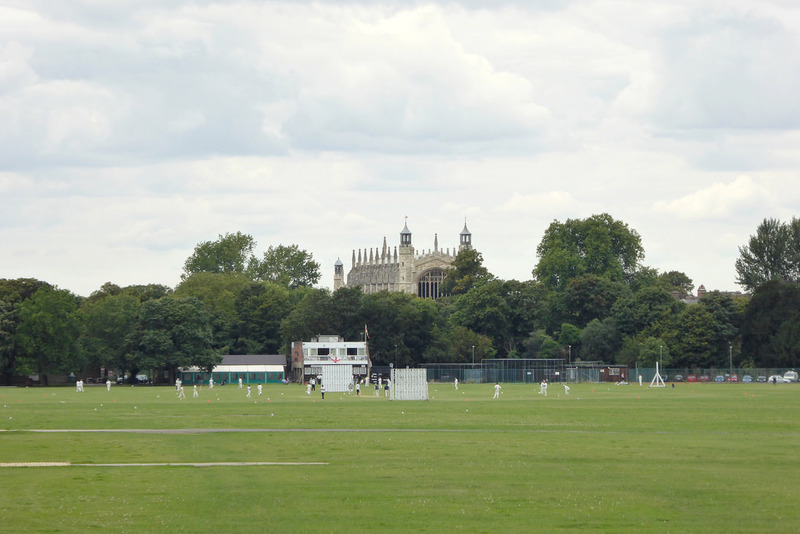 At the north end of the park, a road and a railway line had been cut across the park, and Queen Victoria decided – for some reason – that she didn’t want that bit, and decreed that it should be opened for the public good as a recreational space. A cricket match was in progress as I entered it, and the river bank was full of fishermen. There was even a police car, with a lone copper wandering around, seemingly looking for something, before quietly driving off. 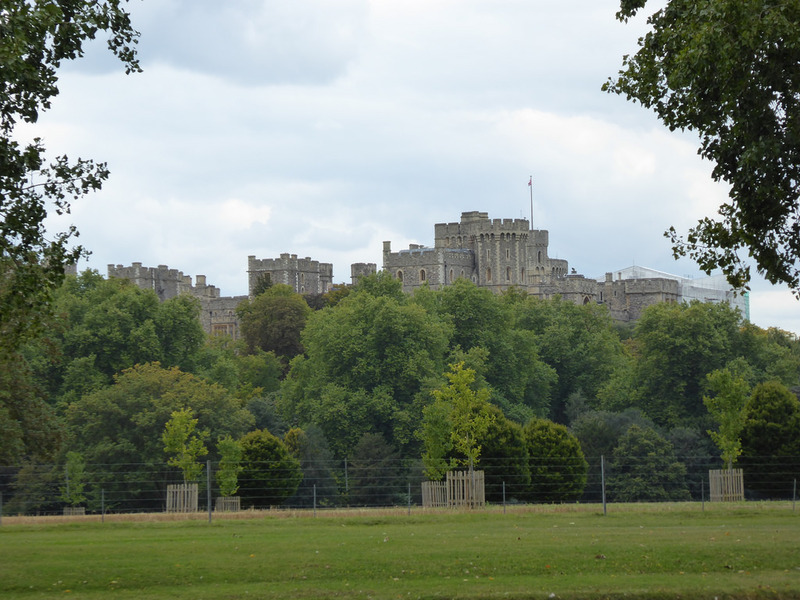 Under the shadow of Eton College and Windsor Castle, I wandered through the park, following the river as far as I could until buildings forced the Thames Path to follow the railway line instead. The town centre was heaving, and there were tourists everywhere. It may have been mid-afternoon, but the visitors were still pouring in. For a moment I considered a celebratory pint in the pub opposite the station but quickly discounted it having seen the size of the crowds standing outside it. I felt like I should spend some time exploring the place, see what had brought so many people here, but I couldn’t muster up the energy or the willpower. After a sedate day wandering along the riverbanks, I had no real enthusiasm for immersing myself into the crowds, dutifully taking photographs of any building that was at least 50 years old. 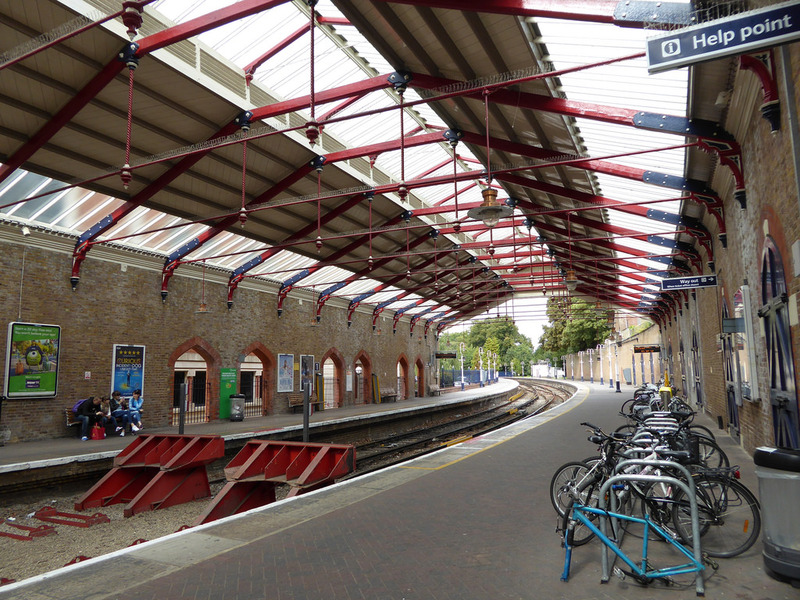 Instead I headed into Windsor and Eton Riverside station itself; a magnificent building which is certainly over 50 years old. And it was certainly more than worthy of having a lone walker dutifully using it as the subject of a photograph or two. First Published: 24 September 2014. Last Updated: 11 July 2016.